HomeBlogEnvironmentWhat Is The Best Solution For Plastic Free Packaging? In recent years there has been an increased awareness of the impact our daily lives have on the environment. Reducing plastic has been a key focal point for many individuals and companies, with a vast number of businesses pledging to reduce their plastic use over the next few years. Packaging accounts for more than 40 per cent of all plastic usage, and it is time that manufacturers and retail businesses made changes to become more environmentally friendly. Plastic-free packaging often seems like a real challenge to achieve. However, there are plenty of plastic-free solutions available. Why switch to plastic-free packaging? Many people know that plastic isn’t sustainable or good for the environment, but most individuals are not aware of just how much plastic ends up harming the world we live in. Plastic is a convenient packaging material because it is cheap, durable and flexible, and it is so popular that it’s estimated we have used 8.3 million metric tonnes of it since the 1950s. On top of this, 79% of the plastic produced in the last 70 years has been thrown into landfill or the general environment, with just 9% being recycled and the rest incinerated. Some of this plastic is toxic and can be extremely dangerous to animals in the oceans and across the globe. Making the switch to plastic-free packaging can be a step in the right direction in reducing this shocking amount of plastic waste in our environment. 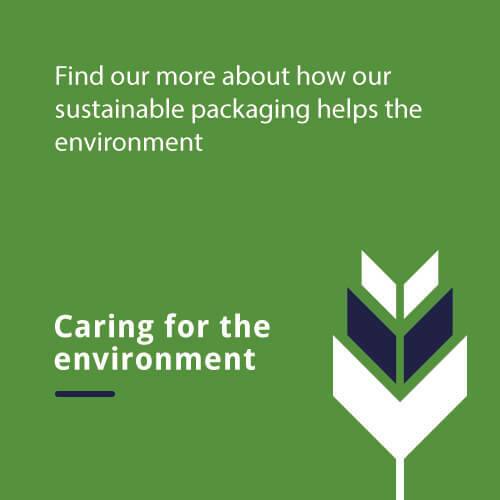 As a business, it is your responsibility to ensure you are helping your customers to reduce their carbon footprint and operate sustainably through plastic-free packaging. You might be thinking your products need plastic in order to be appropriately packaged, but there are plenty of solutions out there for plastic-free packaging. What is the best solution for plastic-free packaging? There is a growing demand for reduction in plastic, and many businesses are struggling to keep up with the demand for plastic-free packaging. Most packaging uses some form of plastic, so what is a reliable and practical plastic-free packaging solution? It might come as a surprise, but corrugated board could be the answer to all your plastic-free packaging requirements. Corrugated board offers a lot of the same benefits and features as plastic when it comes to packaging, without having a detrimental effect on the environment. Corrugated board is stable and secure for keeping products safe and free from damage, while also being easy to ship, carry and transport. It is available in many different shapes, sizes and thicknesses making it just as versatile as plastic for packaging solutions. While plastic does have the added benefit of being shaped and moulded to suit any product perfectly, corrugated board when used properly can be just as customisable and versatile. Bespoke containers can be created from corrugated board as it can be made to suit any product size or shape. Plastic is often used because it is durable and versatile enough to suit a vast range of products. Corrugated board can be subject to a range of different treatments and coatings to help bolster the strength and versatility of plastic-free packaging. A waterproof material can be used to coat corrugated board, and it can also be made flame resistant, making it an ideal plastic-free packaging choice for a range of industries. Cardboard also offers a lot of choice by way of design as it can be easily printed on using digital or screen printing methods. Plastic packaging also provides a range of customisable design options, but as corrugated board can be printed on directly, it is cheaper, quicker and more convenient to use. Is corrugated board a sustainable plastic-free packaging solution? One of the most significant benefits of corrugated board as plastic-free packaging is that it can be produced from 100% recycled material, as well as be completely recycled after use. Not only can corrugated board be easily recycled, but it is strong enough to be used time and time again. Compared with plastic, corrugated board is a much more sustainable option for product packaging. It is also a much more cost-effective plastic-free packaging solution as it is relatively cheap to produce and purchase. Corrugated board is much more lightweight compared with plastic, saving on shipping costs and reducing your company’s fuel consumption. Packaging can be cleverly designed using cardboard to fit product sizes perfectly and save space when shipping, making it an all-round sustainable plastic-free packaging solution.